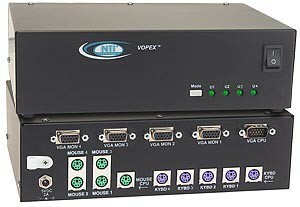 The VOPEX® KVM splitter allows up to four users to share the use of one PS/2 computer. Female 15-pin HD connectors for VGA monitors. Compatible with PS/2 style PCs, RS6000, SGI, and HP9000. Supports hot-pluggable keyboards and mice. The VOPEX® KVM splitter allows up to four users to share the use of one PS/2 computer. Female 15-pin HD connectors for VGA monitors. Supports hot-pluggable keyboards and mice.